The MoonLite focuser is a high resolution stepper motor and uses a premium, low backlash Hurst stepper motor. This provides very fine .00008" resolution and accurate position repeatability required for today's high end imaging systems. You can control the focuser absolute & relative positions. 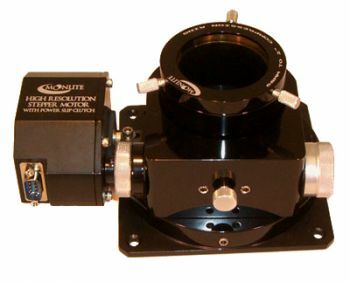 It is recommended that the focuser is completely retracted when powered on as the focuser can only be operated in FOCUS OUT mode at this stage. You can set the temperature calibration and coefficient settings and enable/disable temperature compensation accordingly. Direction: Focus IN or Focus OUT. Focus Speed: Set Focus speed 1 (highest) to 5 (lowest). Focus Timer: Move the focuser at the current speed in the current direction for the specified time in milliseconds. Step Mode: Set stepping mode to either Half or Full (default) steps. Temperature Settings: Set the temperature calibration and coefficient values. The INDI MoonLite driver provides complete functionality for all the features supported by MoonLite including relative and absolute positioning, temperature readout, preset and configuration parameters.